Box Shades – A fully encased exterior rolling screen that stops as much as 86% of the heat, light & UV rays. This type of exterior shade will have side tracks and a weight bar (fall bar) along the bottom. Drop Shades – Similiar to the Box Shade, but instead of tracks along the sides, cables are used. This type of exterior shade normally is not boxed, but can be added as an option. No weight bar is required. The sun’s energy is delivered in the form of three rays; 1) Visible rays, 2) Ultra-Violet Rays and 3) Infrared Rays. The effect is Glare, Fading and Heat. Now you can block these damaging effects before they enter your home. The only solution is to stop the sun before it hits the glass. 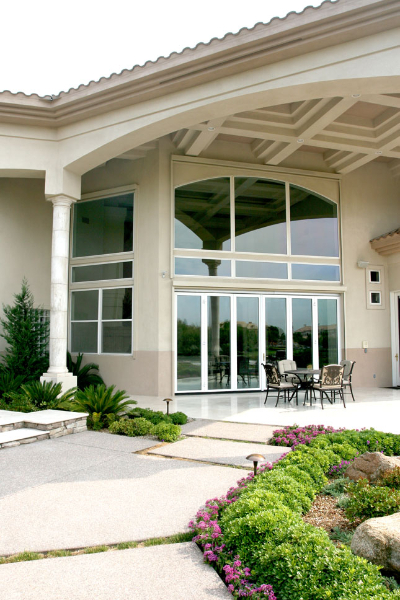 Drop Shades allow you to maintain your view while protecting your home. 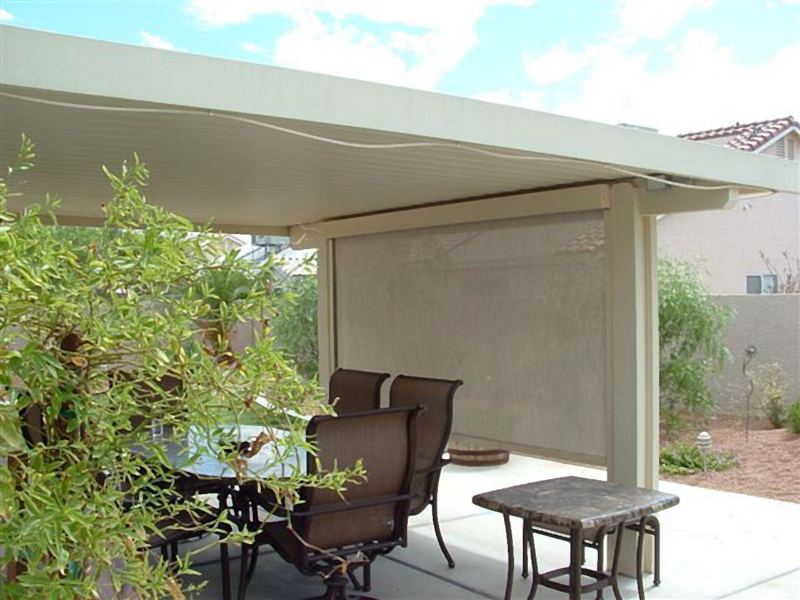 Our shading systems feature Textilene®, a translucent, high density, woven mesh fabric formulated to withstand years of exterior exposure. 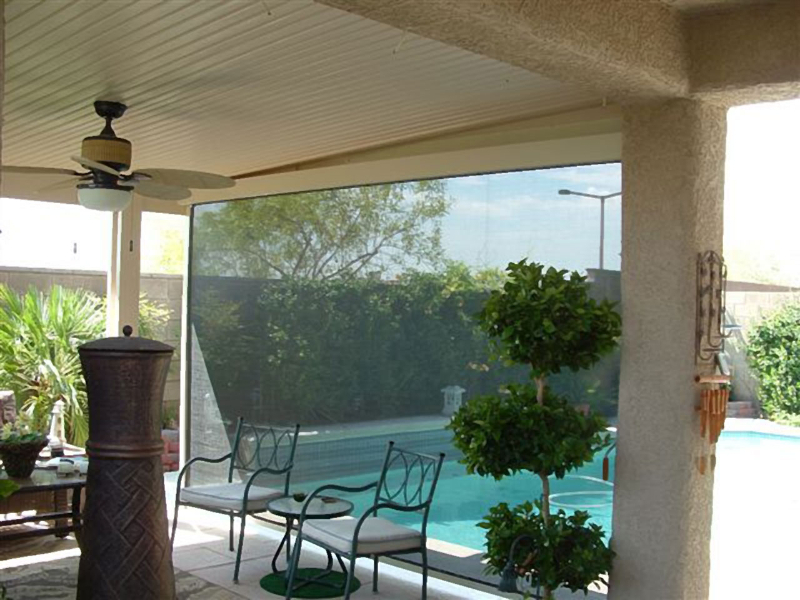 Possible one of the best features of this mesh-type of exterior shade is that it does not obstruct the view. But beware – light colors tend to be reflective. A light-colored mesh shade will create a glow when the sun hits it, while dark colors absorb glare. In hanging a light mesh shade next to a dark mesh shade of the same density, the difference becomes obvious. Remember, shades are a utility product. The effectiveness of the shade is more important than color. 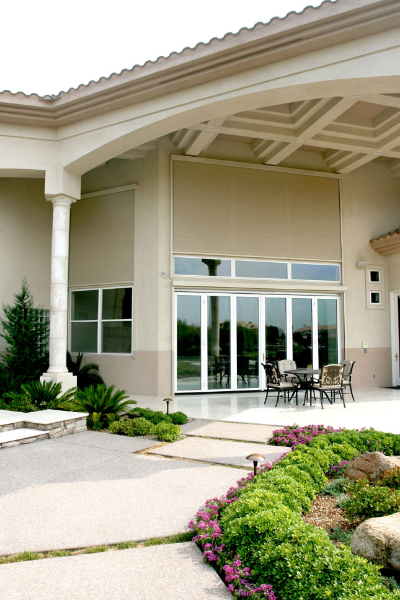 Therefore, to reduce glare and increase shade while keeping the view, dark mesh fabric shades are the best alternative for exterior shading. 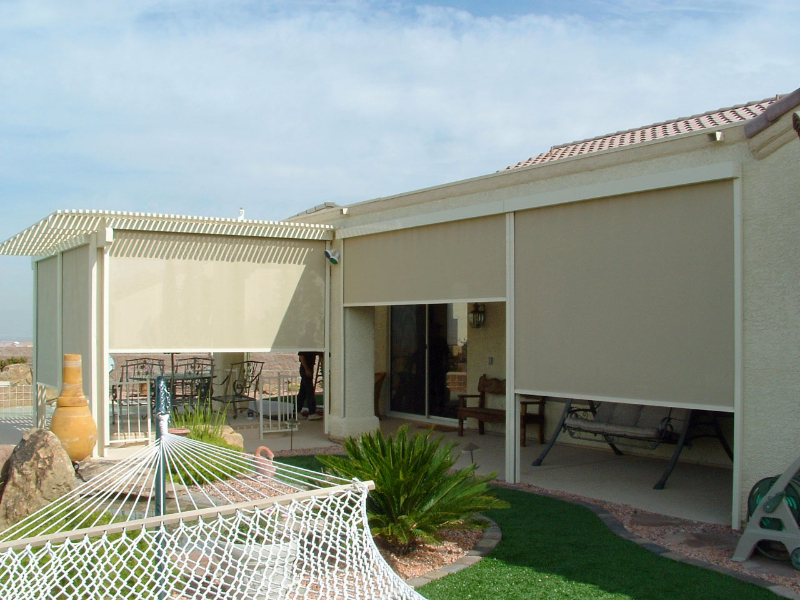 Full view fabric allows you to keep your view while blocking the sun’s UV, heat and glare and provides daytime privacy. Dark fabric absorbes the glare so you can see through to the bright outside. The darker the fabric color, the better the view! 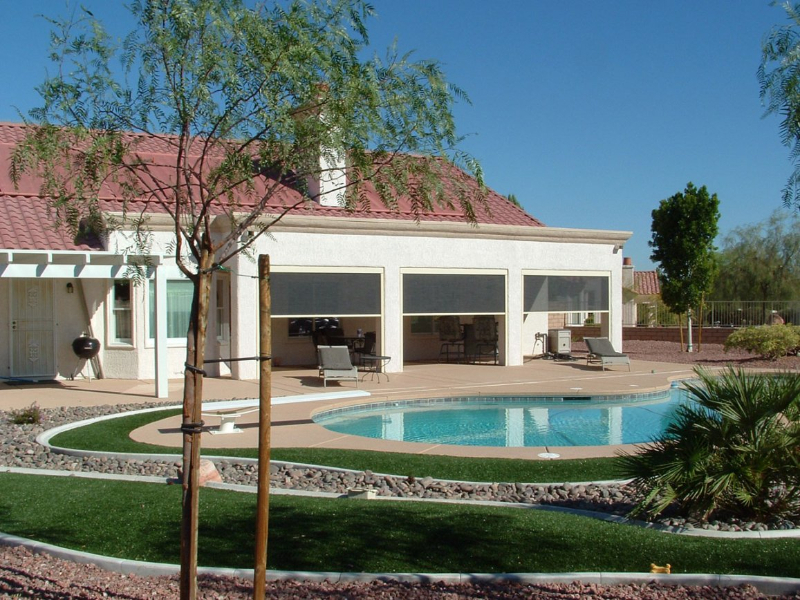 Frames are constructed with high strength aluminum extrusions and protected with a durable powder coated finish. All fasteners are stainless steel or aluminum. Motorized or manual operation UL approved Somfy® motors or 7:1 crank gear for ease of use when larger units are operated by hand. 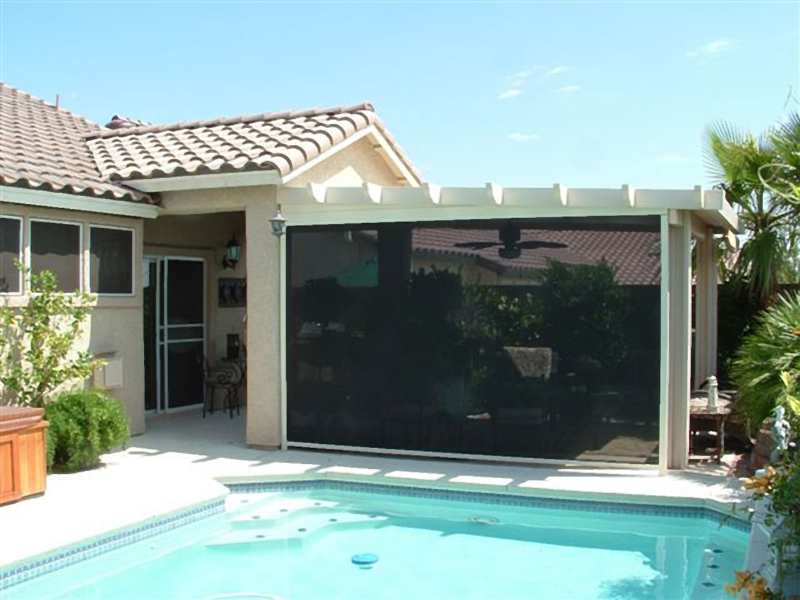 Heavy duty hardware allows this screen system to cover almost any opening. Sizes: 2’ to 21′ width and up to an 18’ drop. All made-to-measure to the quarter-inch. Increased privacy or weather protection, you can even order your drop shade in any Sunbrella woven acrylic fabric.